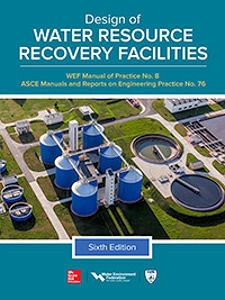 Click to access the Design of Water Resource Recovery Facilities, Manual of Practice 8. The latest edition of Design of Water Resource Recovery Facilities, Manual of Practice (MOP) 8 is a state-of-the-art resource in facility planning, design, and configuration. This comprehensive water resource recovery facility design guide, now offered as a single volume, features contributions from hundreds of wastewater engineering experts. As an added bonus, when you purchase a copy of MOP 8 you also will receive a printed copy of Sustainability and Energy Management for Water Resource Recovery Facilities and electronic versions of Occupational Health and Safety for Water Resource Recovery Facility Design and Glossary of Water Resource Recovery Facility Design Terms. See the Water Environment Federation (WEF; Alexandria, Va.) online store for more information on these and other WEF materials.